One of the most important aspects of swimming pool maintenance is keeping it clean, and regular vacuuming is vital to the health and longevity of your pool. 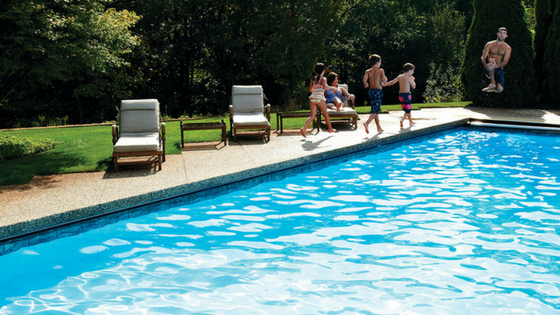 Although the concept is the same, the specifics of pool vacuuming vary by brand. 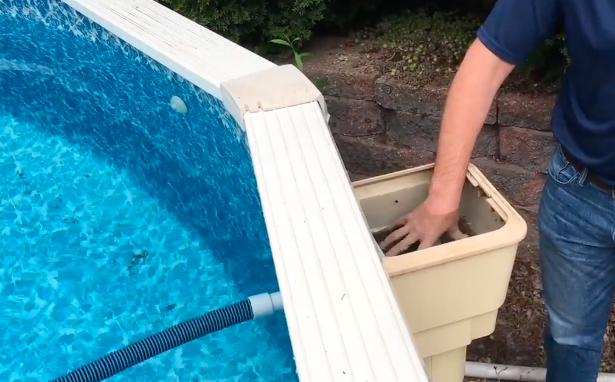 Today, we’re looking at how to vacuum a Doughboy above ground pool. Follow Ryan in this step-by-step video, or continue reading about the process below. To vacuum your Doughboy, all you need are the basics: The vacuum pole (with handle), a head, a hose, and an adapter. 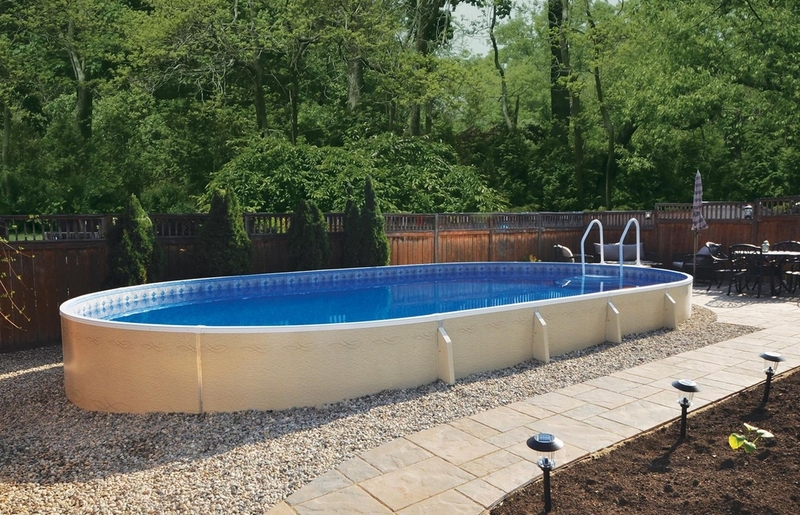 For convenience, you should store all these items neatly and near each other in your pool shed or garage. When your tools are organized and stored in a designated area, regular maintenance is much easier to manage. Once you have all your materials ready to go, attach the vacuum head to the hose. 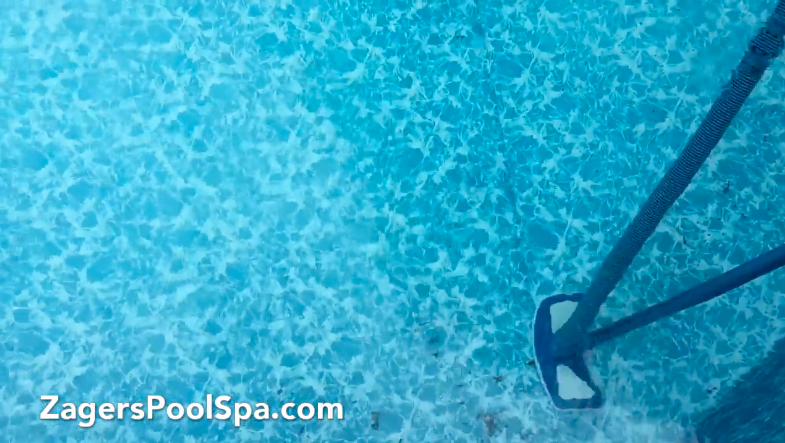 Drop the head into the water, keeping the pole handle out of the pool, as you’ll need that to do the vacuuming. Next, put the vacuum adapter on the other end of the hose, and hold onto it as you drop the rest of the hose into the water. 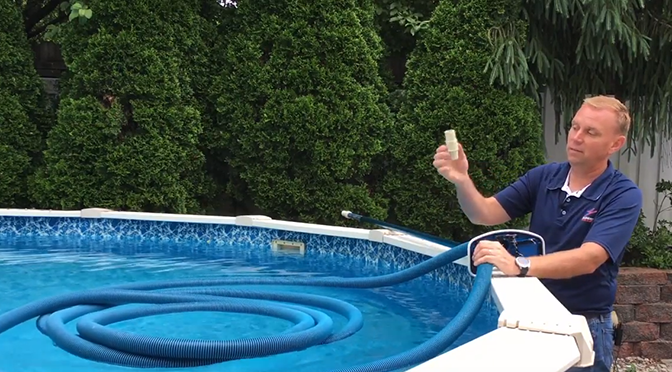 Hold the adapter up to the return in the pool, which will force all the air out of the hose. You’ll see bubbles coming up from the bottom, and the hose will transition from floating on top of the water to sinking to a depth level with the water. Once the bubbles stop, the vacuum head will drop, and you can move the vacuum adapter from the return to the small hole underneath the skimmer opening. It should fit snugly. This is how all the dirt and debris you pick up will be removed from the pool. Remove the skimmer lid, angle the lid forward, and drop it down into the skimmer. The suction from the pump will pull the lid to the bottom, so don’t worry if you think it should be more or less deep than it is. At this point, you’ll feel a definite change in the hose. Now, you’re vacuuming! After making sure you’ve set everything correctly, don’t let yourself slack when it comes to the actual cleaning! 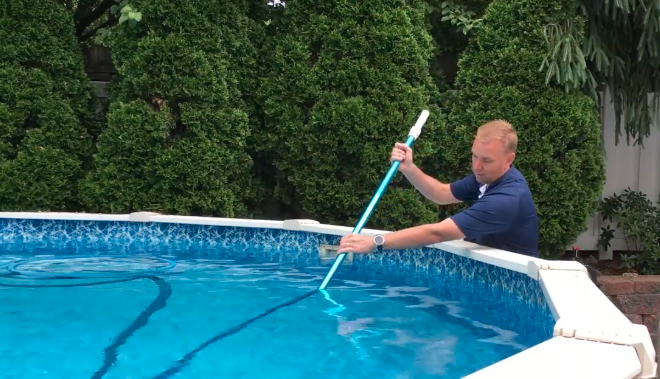 Some people love vacuuming pools, and others hate it—but either way, it needs to be done, and it needs to be done right. 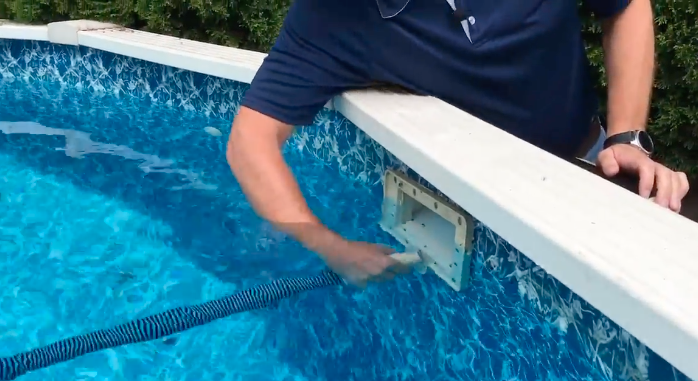 The video above features a hose sold by Zagers that has a swivel cuff at the end; this allows you to easily turn at corners with no more effort required than to make a straight pass in the middle of the pool. The best method is to move around slowly. If you go too fast, all you’re doing is stirring up the dirt and debris, and you’ll have to vacuum all over again. Vacuum slowly, covering the entire pool floor, and you’ll have a pristine, ready-to-use pool right away. Once you finish vacuuming, turn off the pump, which will release the suction. The skimmer lid will float up, and you’ll be able to empty your debris from the skimmer basket and replace the lid on top of the skimmer. Remove the hose from the pool and detach the pole, head, and adapter. Allow all the water to run out of the hose, and then you’re finished! Automatic, Manual, or Hired Maintenance? We’ve described the manual process of vacuuming your Doughboy pool here, and it’s not overly complicated, as long as you have patience and a commitment to doing things right. However, if you’re one of the people who can’t stand the slow, methodical pace required to clean your pool effectively, maybe it’s worth considering an automatic vacuum, or hiring out the job. Automatic vacuums are only automatic once they’re in the water and you turn them on; you still need to connect them, make sure they’re working properly, and get them in the water. There are dozens of robotic pool vacuums to consider, but you need to make sure whichever one you want will work with your specific pool. 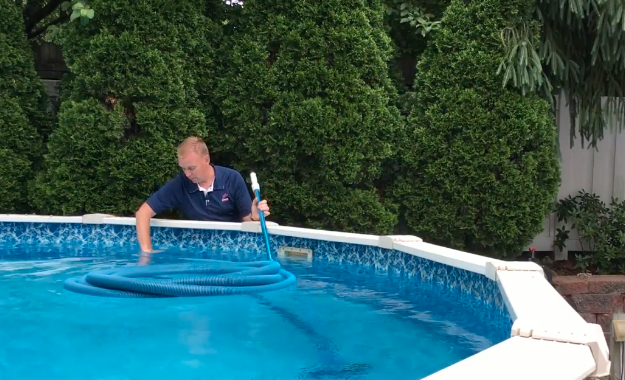 If you don’t want anything to do with any of the vacuuming, hiring out the service is an excellent choice, especially if you’re already on a regular pool maintenance plan. No matter which method you choose, the only truly wrong way to vacuum your pool is to ignore it. Swimming pools require maintenance, but with how straightforward it is to vacuum your Doughboy, there’s no reason to not keep up with it. 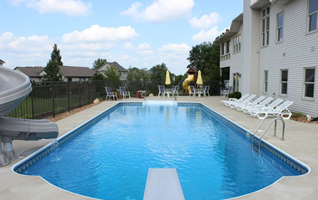 Do you have other questions about pool or spa maintenance? See if we’ve already answered it on our blog, or get in touch! Our pool experts are happy to help.